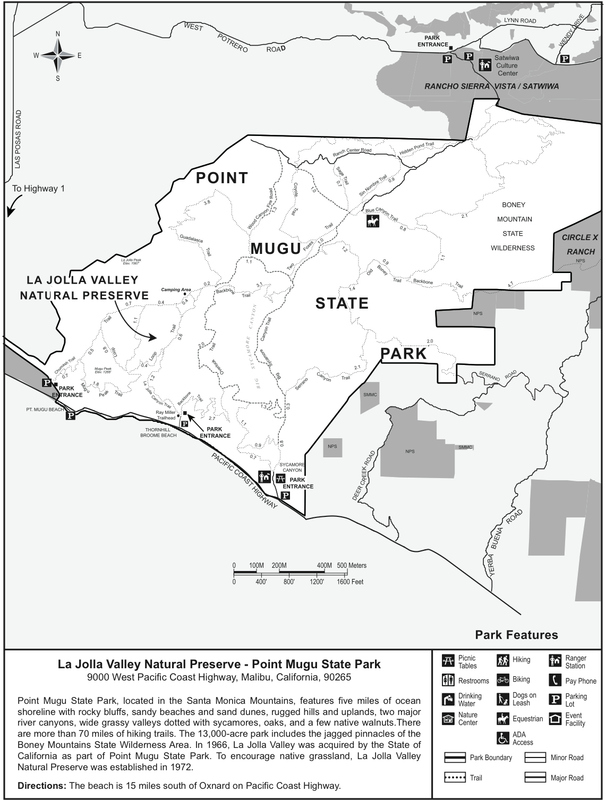 A loop formed by taking the Fire Road to the Fireline Trail to the Overlook Trail to the Scenic Trail from the Sycamore Canyon trailhead in Point Mugu State Park. The fire road section is flat with a gentle grade (probably because it is a fire road) for approx 0.8 mi before the Fireline Trail splits off to the left. Fireline follows a number of switchbacks ascending the hills and passes through some very tall grass and --depending upon the season-- a wide array of wildflowers. The final stretch of Fireline is fairly steep leading up to a hilltop with a picnic table at the 2.1 mi intersection of the Overlook trail. Taking a left on Overlook starts a steady descent back towards the sea. The Overlook cuts back to the East fairly quickly and provides another series of longer switchbacks on it's way back to the Fire Road. This hike continues South at the junction onto the Scenic Trail. The ocean is in view in the distance for a good stretch of the trip back to the Fire Road. Slightly before Scenic rejoins the Fire Road, there are a number of small side trails that meander off into the bluffs overlooking the ocean. The Scenic trail dead-ends back into the Fire Road just beyond the trailhead. From Santa Monica-- take PCH (Hwy 1) North past Malibu to Point Mugu State Park. Sycamore Canyon Trailhead parking is on the right just off the PCH.